I usually figure 3 good-sized potatoes will fit on my pan (today I had a bunch of little potatoes…about 1.5 lbs total). Slice them in half longways, and then slice each half into 5-6 pieces. The potato slices soak in cold water for 10 minutes (this helps to remove some of the starch so your fries get really crisp). While they’re soaking, prep a sheet pan with some vegetable oil, kosher salt, and pepper. Pat the potatoes dry with a towel and arrange them evenly on the pan. If you crowd them, they steam a little and don’t get as brown, so it’s worth it to give them a little room! Then they get a little drizzle of oil on the top and more salt and pepper. The other trick is that the fries bake covered with foil for 10 minutes, then with the foil off for 10, and then you flip them and bake for the final 10 minutes on the other side. So they’re a little high maintenance, but at least you don’t have to keep looking at the recipe since you know it’s 10 minutes every time, and you can be making sauce for grilled chicken, or mushing together your maple turkey burger patties, or shredding your crockpot bbq beef…oven fries go with anything! 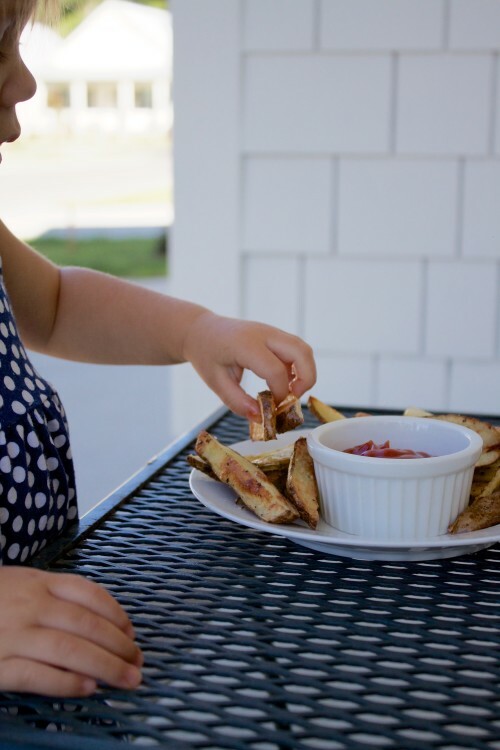 We super love these oven fries…they disappear fast at our house. Before you get a chance to finish taking pictures, in some cases. Preheat the oven to 475. 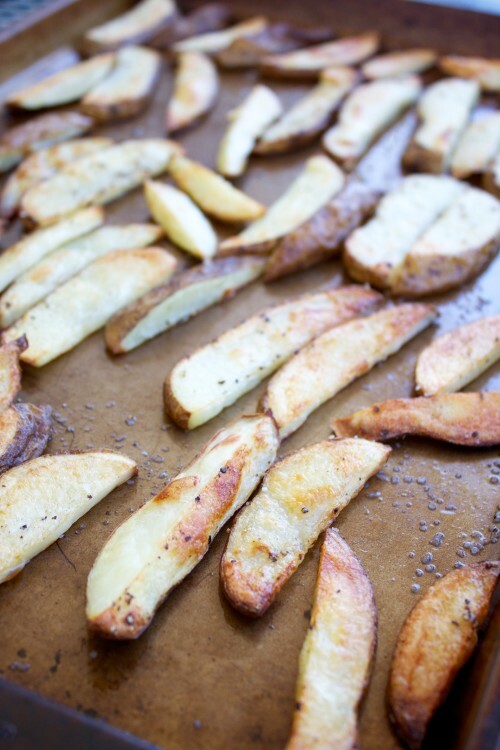 Scrub the potatoes and slice them in half longways, then slice each half into 5-6 fries. 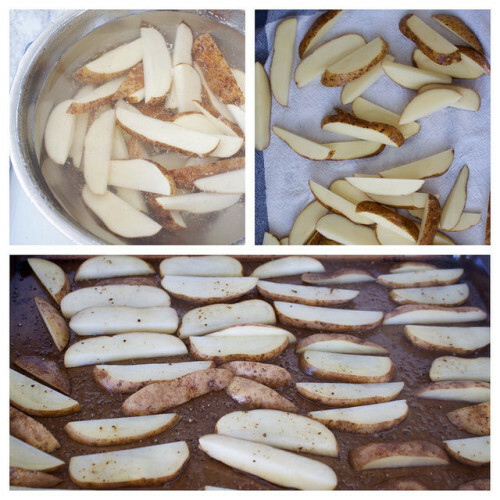 Put the potato slices in a bowl of cold water to soak for 10 minutes. Meanwhile, prep a sheet pan by drizzling it with 2 tablespoons of vegetable oil and sprinkling it with salt and pepper. 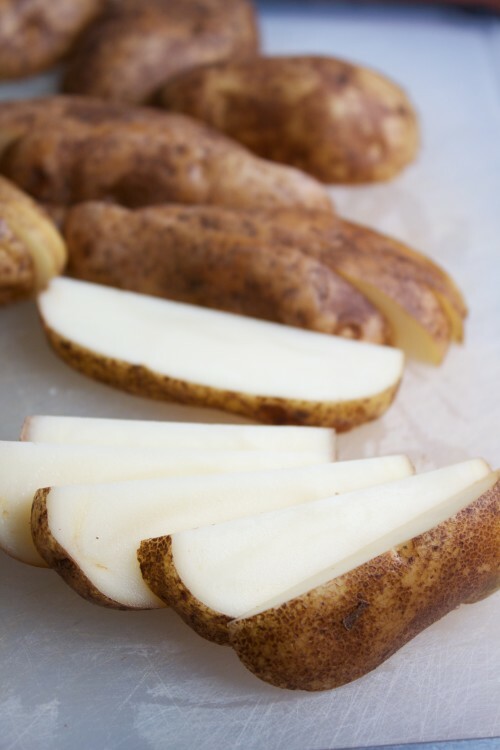 Drain and dry the potatoes throughly with a dish towel. Arrange them evenly on the baking pan in a single layer, ideally giving them a little room so they can get really crispy! Drizzle the top of the fries with the remaining tablespoon of oil and sprinkle the tops with more salt and pepper. Cover the pan tightly with foil and bake for 10 minutes. Remove the foil and bake for 10 minutes more (until the bottoms are golden brown, keeping in mind that they will continue to brown a little more once the fries are flipped). Flip the fries over with a spatula and bake for about 10 more minutes on the other side, until they’re brown and crispy! Recipe from Jeff Mauro on Food Network – I tried the recipe originally because I saw them all tossed with garlic butter on his show and Wanted Them, but I’ve never actually had the guts to put butter on french fries! We always make oven fries, but I hadn’t done the water-soaking part before. Nice and crispy!!! I made them last weekend when we had a group of college students/young professionals over for a cookout, and they snarfed them up. One of the guys asked for the recipe. I told him I’d text him the link, but didn’t get around to it that evening. When I saw him at worship the next morning, he said, “You didn’t send me that recipe!” So you know it’s The Best when you’ve inspired a college boy to cook! Yum! I made these last night to go with our salmon. They were a hit. Jim loved them! Yay! I’m so glad you guys enjoyed them, Christen!